Re-vers-i-what? A Scrum thought leader explains how to truly do Scrum, the internal organization of the company must be changed. Organizational rigidity is the result when people are separated in functional silos; when collaboration is instructed through hand-overs and governance; when go-see management is not practiced; when the daily work has no room for discontinuous innovation. Basically, such rigidity is the antithesis of Agile and impedes outward agility. Scrum is a simple framework for complex product delivery. Scrum thrives on the self-organizing capabilities of collaborative people creating finished versions of a product in short cycles, called Sprints. Scrum is in itself agnostic of internal structures, positions, titles, hierarchies. Scrum has no mandatory rules for organizational constructs. Scrum is simple, not easy. The simple rules and roles of Scrum are most often twisted and broken to fit an existing organization. Yet, it is nearly impossible to benefit really from adopting Scrum without updating the internal operating systems. The sensible and courageous way forward is to re-vers-ify, to re-imagine your Scrum to re-emerge your organization. It is a path, not the destination. The destination, an updated organization, is unknown and remains to be discovered. Use the Product Backlog as the single plan for one (1) meaningful initiative (project/product/service). Slice the initiative if it is too big. Reset the accountabilities for the selected initiative to Product Owner, Scrum Master, and Development Team(s). Facilitate the ecosystem with tools, infrastructure, and a (Scrum) team zone in order for them to create sashimi releases. A controlled and automated deployment pipeline is certainly a much-needed step forward. 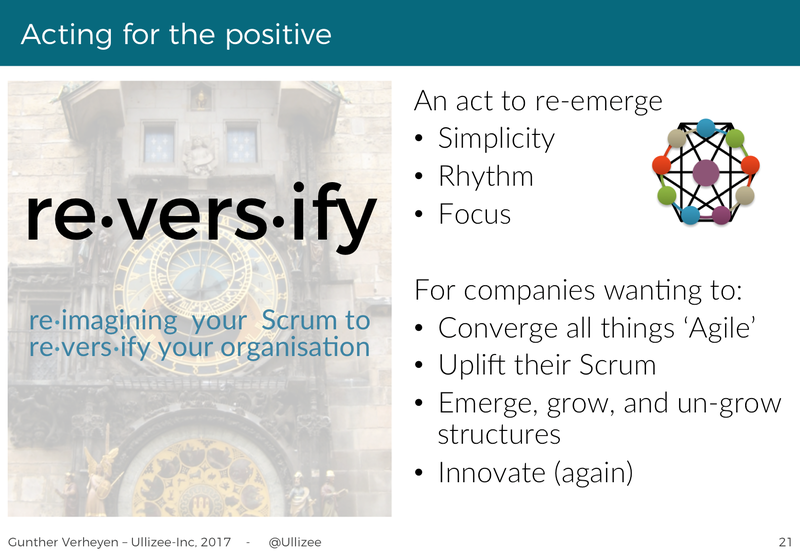 "Re-vers-ify" is a narrative to help people re-invent their organizations; an invitation for people to re-imagine their Scrum, to re-vers-ify their organization. Over the course of 2017, I have introduced re-vers-ify in several ways. I have now highlighted the essence in a short movie. It takes only slightly over 3 minutes of your time. Enjoy!